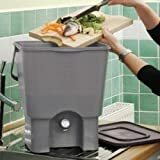 With a Bokashi Kitchen Composter you can recycle your kitchen scraps including meat, fish and dairy products with no smells and no flies. 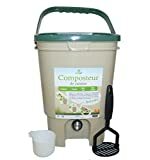 Blackwall almost have the market sewn up for Bokashi composters in the UK. The reason is their product is simple, it works and it’s well priced. Except for the tap, the drainage system is very effective with an inner drain tray and sloping base that does a good job of channelling off any excess Bokashi juice. It’s an easy to clean and effective Bokashi system. The drainage tap can be easily overtightened so the Bokashi bin leaks! We solved the problem by replacing the soft silicone washers with decent rubber ones (available from any hardware store). And, the plastic carrying handle could be sturdier.